as you can see there are quite a few houses here, and there is more to the right of the photo - a very popular place with absolutely nothing here only a general store and a tavern/restaurant above the caravan park. We did have a little drama in the caravan park in the afternoon ... someone came towing a very long caravan and as he went to turn he took it too wide and didn't take into account the part of the caravan behind its' axle and it did a 'tail swing' (I think that is what Neil called it?) and his van scraped alongside a parked car ... it was an awful sound and the caravan had most of the damage being like a tin can whereas the car (which is a very old ute built like a tank) only had one long big scratch. Well that certainly got everyone chatting! This morning we left and diverted to Warooka to pick up some food for the next couple of days. The wind was blowing from the East completely which is unusual as normally there is a bit of a north or south associated with it. 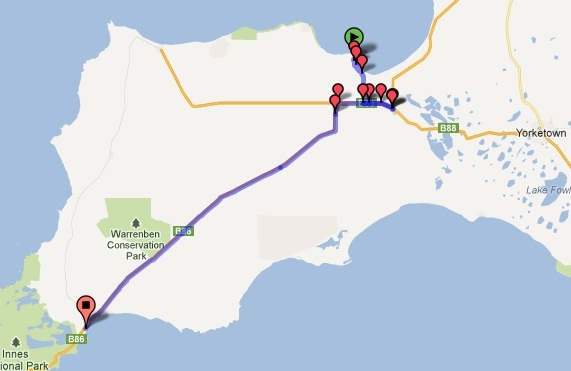 Nevertheless it was a headwind into Warooka and then back out it was a tailwind and we took the Marion Bay turnoff which heads in a south west direction so it was a cross tailwind for us. The road is very quiet and a little bit bumpy at times but great to ride. Both sides of the road have low shrubs so you are protected from side winds. We did have a little encounter with some cows being moved so we pulled over and let them have the road ... Kouta was super excited about us pulling over to watch ... The cattle saw us and immediately stopped and bellowed but when cars went past they just ignored them but with us they always stop and look! and then he looked at the other side when they passed us ... stretching his neck even further to smell them ... he now looks like a Lama with his enlongated neck! Once they passed we continued on and had a cuppa at 30km (half way). There was very little traffic along this road ... I would say a bit more leaving Marion Bay. Marion Bay itself is a small community although there are land sale releases everywhere - not sure if they want to be like Point Turton! But not alot of new buildings. The National park is a little further on but because we have the dog we will not be visiting it. Instead tomorrow we will take the north road that runs alongside the national park up to Corny Point. The campground is almost empty, big and caters for caravans. We have got an unpowerd site as they have a big kitchen which is where I am doing this blog. Huge fridge and freezer, kettle and toaster, bbqs which cost $1 for 15mins and a gas stove/oven which I will use to cook our gnocci on tonight. Our unpowered site (one of 2 in the park!) is nestled in amongst trees and we are around the sites that tend to have permanent holiday vans here but no one is about so that is good.